← A Wemyss Ware Book? This is a very brief history of Wemyss Ware. It will be expanded upon greatly in later blog posts and eventually put together into ‘the’ book. 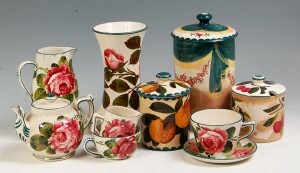 Wemyss Ware was first produced in 1882 and contemporary Wemyss Ware is in production today. However, it has not been produced continuously, there have been voids and different potteries have produced Wemyss Ware over the years. To my knowledge no one has ever properly documented the complete history of Wemyss Ware. This is a very brief history of Wemyss Ware including the period from 1957 to present day which has so far been largely undocumented. This brief history is essentially a precis of the book I have yet to complete. This entry was posted in Uncategorized and tagged Fife Pottery, Kirkcaldy, Robert Heron, Wemyss History, Wemyss Story, Wemyss Ware, Wemyss Ware History. Bookmark the permalink.